The way we are going is more current. We’re really proud of what we’re doing so far. We’ve got five tracks done so far, because we work in the day, we kind of work around that, we get it done when we can. Hopefully, we’ll have an album’s worth by 2020 [laughs]. I don’t know, but it’s gone pretty well so far and the producer we’re working with is really good. But it is different, but not different totally. Different good. We’re really proud of [Forever In Your Debt] though, so if the rest of the album can come up to that standard. I think there’s one or two at the moment that we probably think are there, then we’ll be more than happy. But to me anyway, I can’t speak for everybody, but I think that is kind of a blueprint, like the bar, that we want to meet. It might be that people prefer the other stuff that we’re doing more than that one but we’re proud of Forever In Your Debt and that’s why it’s going to be the first single…I remember the first couple of times we did Forever In Your Debt live and my heart was just up in my chest, you know what I mean. Especially, when you’re first introducing it to people, and the reaction for that one has been pretty good live. The song started with Jim’s bass. It has quite a good groove. It’s been one of our most successful singles. It’s had a lot of success overseas, particularly in Italy…It’s about finding hope through being in love with someone despite facing life’s difficulties. The band release a lyric video for Start Again, from their album Cavalcade. The Stone Roses and The Smiths are probably our favourite Manchester bands, we didn’t grow up in that era but their music still featured heavily on the playlist at indie clubs like 42nd Street, 5th Avenue and the Venue in our formative years. We were on the same bill as Peter Hook at Salford Music festival, didn’t even realise he caught our show till he was bigging us up in the NME. He is a legend isn’t he, so it was a great honour. The Coldplay thing was even more bizarre, our video for ‘Block Out The Sun’ featured on the Coldplay site for a week in a gallery section where they highlight anything from music to art. Brought us a good few thousand views and more importantly lots of new fans. It was great of them to give us their endorsement and share our music with their following. The band release the official video for Don’t Mind, from their album Cavalcade. Yeah, Kurt had been in a band with David as well before so we were all familiar with the live scene in Manchester. I think our first gig as Omerta was at Band On The Wall and probably our first gig as SRC was at Ruby Lounge. We’ve played a few places around Manchester, some of the newer venues as well like Soup Kitchen and The Castle we’ve played recently. There was a thing in the press recently about it being the most live venues in the country of any city. There’s a lot of choice. There’s not always people there. More recently there tends to be more people. These venues become trendy and suddenly they’re not trendy any more. It’s a cool city for music. It was nerve-wracking, but it was cool. It’s quite a good sound in there — I was surprised. The band release the official video for I Saw A Ghost, from their album Cavalcade. Aaron Starkie is interviewed by MancunianWays.com. On releasing Cavalcade as an album. We’d had various bits of advice, and the industry is changing to less of a focus on the album, and more on singles. But we always thought [the songs] would be part of an album…If I had one criticism of the first record. It’s well loved by fans and I love it myself. Some of those tracks we’d recorded three or four times by then, and you just haven’t got the energy that you have when you go into the studio and write it for the first time. I’ve got two young kids, a four-year-old boy and a six-month-old girl. And was seeing my son grow up, the speed he changed from a baby to a toddler. And it made me think about me leaving home, and one day him leaving home, and all that melancholy stuff. There’s a track on Seargent Pepper’s called She’s Leaving Home, it’s the same kind of sentiment. One day you are going to go out into the world — the Cavalcade — and it’s a big adventure. 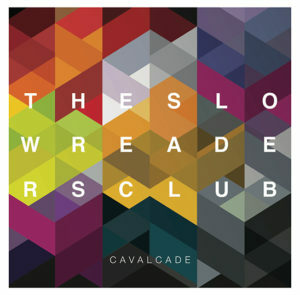 The band releases their second album, Cavalcade. The album is produced by Phil Bulleyment. Its dynamically a bit more sophisticated, the individual instruments have a bit more room to breathe. This is partly due to us getting better as musicians but our producer Phil Bulleyment played a major role in shaping the sound of this record. Fundamentally though it’s popular because the songs mean something to people, it’s been fantastic to hear people singing along at gigs and it’s amazing to share that connection with people. We’ll be the first band to play here. We feel really privileged to be involved. The band perform Plant The Seed on the Jack Rocks This Feeling stage at the Isle of Wight Festival. We went into the studio with the track unfinished. The chorus came from a random ad-lib I did while the track was on loop and we were all sorting out our parts. I wanted to write something hopeful as the rest of the album is quite bleak. Any one of us can kick the sing off. Sometimes it’s a keyboard part, sometimes a bass line. I will then sing a vocal melody over the top with nonsense lyrics at first. The proper lyrics come later, usually on the day of recording. We’re really looking forward to playing the Classic Grand. We have great fans in Scotland and Glasgow is a great city. It feels a lot like Manchester actually. Glasgow crowds seem to be well up for a good night and won’t just stand there stroking their chins. We had a warm welcome the last time we played there at Stereo. We’re very proud of Cavalcade and glad it’s been well received. Word seems to be spreading as gigs are getting busier and busier. We’ve just played a sold out show at Manchester Gorilla and that blew us away. On the first album, some of the tracks came from a previous incarnation of ours, a band called Omerta that Jim and I used to be in, so the first album was written over a much longer period than this one…The songs stood up but a lot of the first album felt quite old, to us anyway, but the second album, that was written over… maybe two years, I don’t know…Two years, around day jobs and things, and we had a really good working relationship with the producer – not that we didn’t on the first one, but I think he got a little bit more out of us, and it was a little bit closer to what we wanted…We’ve got more of our own sound on this one, maybe, whereas on the first album we were trying out a few different things, sort of big string-symphonic melancholy stuff, synth-driven stuff. We’ve the same on the second album but less… less orchestration, I guess. The band is interviewed by GIGSoup. On still working day jobs. A lot of bands that are a higher level than us still have day jobs…we speak to them and they’re all on a decent label and having success but they still work. You just think, it would help (not having a job) because you could do like 20 date tours and go around Europe, we have got fans overseas and stuff, but for the moment it’s not on the horizon. You get a lot of trust fund kids basically in music these days and I think that’s why the accent seems to have been exclusively middle to upper class. It seems from the outside it looks easier to ‘make it’…it seems you just throw a video on Youtube, get 3 million views or whatever, and that’s it but you know there’s a lot more that goes on behind that, the time, the effort. AS: I think we’re learning that more and more. The last gig we did at Gorilla, the lighting show a was a big part of it. And that’s something we’re considering more for the future, perhaps involving video. In terms of writing, somebody comes up with a riff, whether Jim on the bass, or me on the keyboards, or Kurt on the guitar. Then we jam around that for a while. A lot of the time we’re beating the hell out of it to get it into a working a song. And I’ll have random lyrics for a while. Then there’s other ones like Don’t Mind, that came from start to finish in one complete unit. It’s amazing when that happens. JR: We don’t sit down write a song that sits into our image. AS: There’s a few that have been dismissed for being a bit too sunny. Manchester is an important city musically and culturally it has given the world so many great bands. That is both a blessing and a curse. There are a lot of great bands coming through in Manchester but it’s quite varied; from psychedelia to electronic to traditional guitar bands. I don’t think there is one sound that unifies it as a ‘scene’. Then again I’m not sure that was the case with ‘Manchester’ either, I guess scenes are often about fashion and drugs as much as the music I suppose. Kurt & Aaron Starkie perform a cover of David Bowie’s Life on Mars at Sound Control in Manchester. James announces that The Slow Readers Club will be support act on the upcoming Girl At The End Of The World tour. Delighted to announce our support for eleven of the May dates on the Girl At The End Of The World Tour will be an up and coming Manchester band Jim and Saul have been championing of late, The Slow Readers Club. They’ll be joining us in Bristol, Southend-on-Sea, London x3, Norwich, Bournemouth, Llandudno, Hull, Newcastle, and Nottingham. You can listen to a particular fave of Jim’s here – I Saw A Ghost performed live in Manchester Library. In an interview with Gigs North East, Davis praises the Slow Readers Club, who will support James in their upcoming tour. 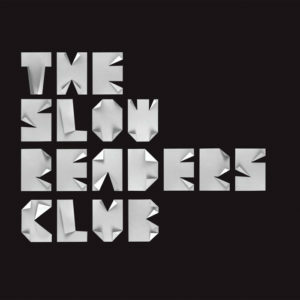 There are a newish band from Manchester called The Slow Readers Club. They are opening up for us in the majority of our shows in May. They’re really good. They’ve made an album called Cavalcade which I have to say I really, really think is a very good record. Anybody coming to see us play should listen to Cavalcade before they see us and catch Slow Readers Club because they are really good. I’m yet to see them live so I don’t know how that’s going to work but the record certainly is really good, full of exciting, interesting songs. There is a real sense of: will those icons of that level exist again? When I was young I used to get on the bus, go to town, buy an album, read the sleeve notes on the way back. You’d listen to it from start to finish. But music is so accessible now. It’s very difficult for bands now to glue onto people, and get fans for an album. Things like YouTube and iTunes are good, but the drawback is that the listeners switch on, they listen to you, but just as quickly they switch to something else. When we do connect we feel more privileged, but it hard to see somebody being that level again. 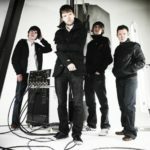 In advance of their first Northern Ireland show, the band are interviewed by State.ie. On whether 2015 was a breakthrough year. Yeah it definitely felt like a step up, in Manchester we have gone from playing venues like the Night and Day to selling out Manchester Gorilla. We’ve been touring a lot too and building our fan base in different cities, Sheffield, Glasgow, London and more recently Dublin have been great to us. We also played some decent festivals last year with Isle of Wight and Ramsbottom festival being highlights. We’ve had a good few plays from BBC 6 Music and Radio X in the UK and the support from TXFM Dublin has been phenomenal. Our single ‘Don’t Mind’ featured on Steve Lamacq’s round table. 2015 was fantastic but things have kept building this year too, it’s a really exciting time for the band and for the fans that have followed us. The band perform a series of UK concerts as the support for James, starting in Brighton.
.@slowreadersclub So much appreciation from the fans, certainly the best response to a support band we've had since social media took off. 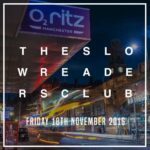 The band announce that they will headline Manchesters O2 Ritz on 18 November 2016. We’ve been very warmly received by [James] fans and the band. The most we’d done on our own was 600, but the lowest for James was 2500 going up to 5000, and then 20,000 at the Arena. They couldn’t have made us feel any more welcome. Aaron: The intention is, for the Ritz gig that we’ll have a few tunes. We’re kicking around six or seven ideas that aren’t sort of fully formed yet. It’s usually me that holds it up. I wait for the last minute for the lyrics. The band release a video of rehearsals, including an early version of Lunatic, a full run through of Plant The Seed, and I Saw A Ghost. Kustis and Aaron Starkie perform Forever in Your Debt for the BBC in Manchester.